I love Sugar Babies. I love their cute, conveniently “poppable” small size. I love their rich, sweet caramel taste and the long chew they provide your mouth. I love how they won’t melt in the summer heat. 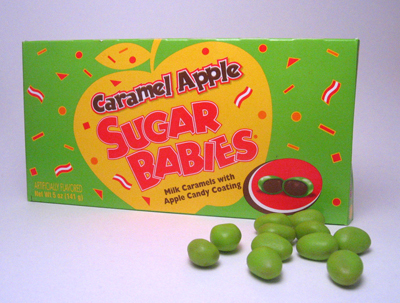 So to say I was excited, when I saw the new Caramel Apple Sugar Babies in their bright cheery green box at my local store, is quite an understatement. Once I was home I immediately opened the box to see what these new Sugar Babies looked like. I was surprised when I rolled the first few into my hand. Whoa, these were so strange! The coating is a matte bright green and they seriously looked like plastic peas! The felt a little greasy to the touch, yet they didn’t leave any residue on my fingers. Again, strange. The coating comes off immediately once it’s in your mouth. It’s the standard sour green apple Jolly Rancher flavor. It really hits your taste buds, as the flavor comes rushing in like a tsunami and then disappears just as quickly. Then the Sugar Baby comes in with its familiar sweet caramel flavor and stick-to-your-teeth texture. It’s like encountering your best friend in a Halloween costume: at first you’re confused, and then the familiar face appears from beneath the mask. These are good, but they really feel like two separate candies to me. The two flavors interact so separately in your mouth that it’s hard to try and “taste” a caramel apple in there. They’re worth a try if you’re a big Sugar Baby fan, just to say you did! I just know that I will love these. Oh I hadn’t heard of these – yum! Mmmm sounds yummy. There’s a lollipop kind of like this that’s really good. I just love your comparing tasting the candy to seeing a friend uncover from a Halloween costume! Excellent imagery and very creative! Not being a big fan of green apple-flavored candy, I’m not sure how I’ll feel about these but that’s certainly not stopping me from TRYING them out, of course! I am, after all, like all of us, a true candy ADDICT! I loved these sugar babies – I also love this website! Caramel Apple sugar babies are absolutely delicious. I first tried them at Cracker Barrel. Got addicted immediately. I went back to get another box and they had sold out, I wasy hysterical. The sales clerk told me that they were seasonal. I just discovered yesterday that Walgreens sell them. I bought five boxes..Crazy right, but I just love the way the two flavors complemiment each other. You have to try them. I love anything green apple/sour apple so when I saw these in Walgreens I had to try them. They’re really good, and I had my co-workers sample a few and they wanted more! Walgreens has them at 3 for $3.